THERE WERE TENSE scenes in the Dáil this afternoon as deputies used Leaders’ Questions to discuss the high-profile eviction case in Roscommon. The exchanges between Pearse Doherty and the Taoiseach ended with Leo Varadkar telling the Sinn Féin TD that “it doesn’t take very long for your balaclava to slip”. He had criticised Doherty for not condemning the group of people who had attended the house at the centre of an eviction order in Strokestown last week “armed with baseball bats [who] injured three or four other people, set cars alight and caused an animal to be shot dead”. The leas-Ceann Comhairle Pat ‘The Cope’ Gallagher had a job on his hands to keep order following the remark, warning deputies on both sides to sit down and stop shouting. Doherty asked for the record to be amended to expunge the comment from the Taoiseach. Gallagher said the transcripts of the conversation would be checked when they are ready. The Donegal TD had been questioning Varadkar about the lack of regulation around security personnel hired by financial institutions, describing some bank enforcers and rent receivers as “thugs”. The Taoiseach said he agreed that “proper regulation” was required in the area, noting that the Justice Minister had also acknowledged this yesterday. The Roscommon eviction has made headlines this week following what gardaí have described as an incident of “criminal damage and assault” over the weekend. An eviction order in relation to the home was executed last week, during which three members were forcibly removed. On Sunday morning, a group of people came to the property with an aim of removing the security personnel. A number of vehicles were set alight and three of those attacked required hospital treatment. A dog was also seriously injured and had to be put down as a result. 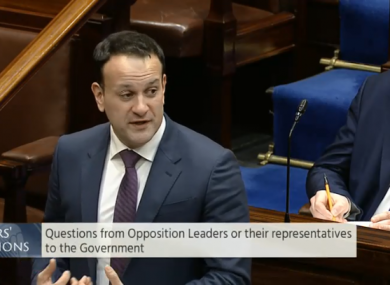 Today, Varadkar said that those in the Dáil should be mindful “not to say too much about individual cases”, adding that newspaper reported had indicated tax evasion in this instance. He noted that 400 eviction order were executed in Ireland last year, and that the High Court has an extremely high barrier for issuing them. Email “'It doesn't take very long for your balaclava to slip': Ructions in Dáil as Taoiseach and Doherty discuss Roscommon eviction”. Feedback on “'It doesn't take very long for your balaclava to slip': Ructions in Dáil as Taoiseach and Doherty discuss Roscommon eviction”.